First off i did hope that Clarky could come with me to collect my new watch. It is always a good idea to bring along a friend who can fend off the technical questions, mainly so I don't look too foolish. Unfortunately he could not make it, so I did set off with a little trepidation. A few months ago a fellow forum member posted on here about buying a watch make that I had not looked at before. His feelings were that it was a well-made and reliable watch, so that seemed to be some important boxes ticked. I had a quick look at their website, and then thought nothing of it for a while. About 8 weeks ago Chris Ward was talking about English watch makers other than CW, which reminded me to go back and have a look. 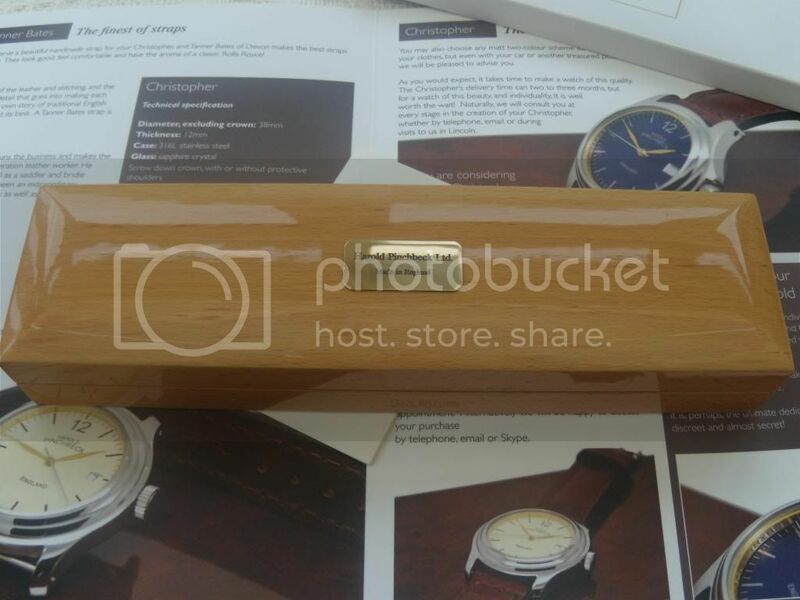 So I fire an email off, to ask about the watch, I wanted to see if I could have a picture of the back of the watch sent for me to have a look at, all other information that I wanted was on the site. So I chose the red second hand and a parchment face. The midnight blue looked too black for me. I asked if I could collect on 9th September, as it was a 2 week delivery (made to order) would they hold it for me. Not a problem as they would hold back production. So this morning, up a 6am and set off. 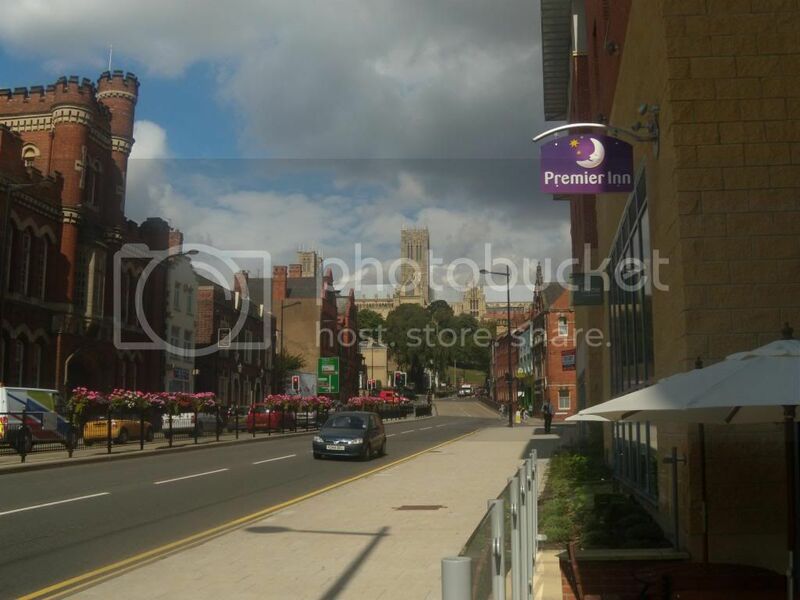 A small work related thing to do first, and then head to Lincoln for my 12 O’clock meeting with Mr Paul Pinchbeck. 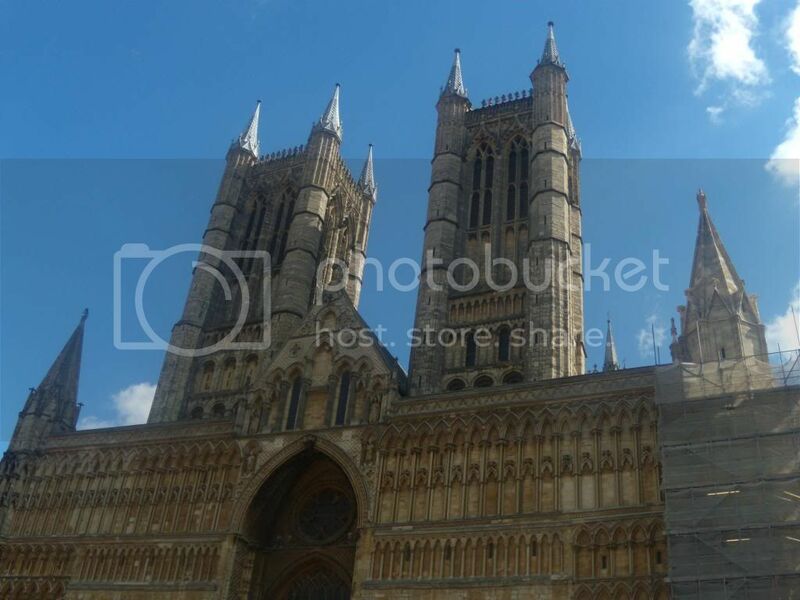 He had suggested that we meet in the Lincoln Cathedral Centre Minster Yard for coffee and a look at some others of his watches. I did ask to see the Superior Brough SS101. At the meeting was also a very nice chap, whose name, to my shame escapes me, he did say his background was engineering . Paul also bought along the watch that Jason McKinlay had worn on his 2,000 mile row around the British coast, which was in great condition after all that salt water. The Brough Superior SS101 that was shown was smaller than the one shown on the website, Paul explained to me that he could make the watch case a few mm smaller or larger than shown on his site. Just to cover that point, not all watches and not huge size variation but he did say it was worth an email if interested. So I collected my watch, Paul suggested that a longer strap would be better for me, which he would send along in a few weeks once it had been made. All in all a very good day, a pleasant buying experience and very nice people from a English watch maker with a long history. 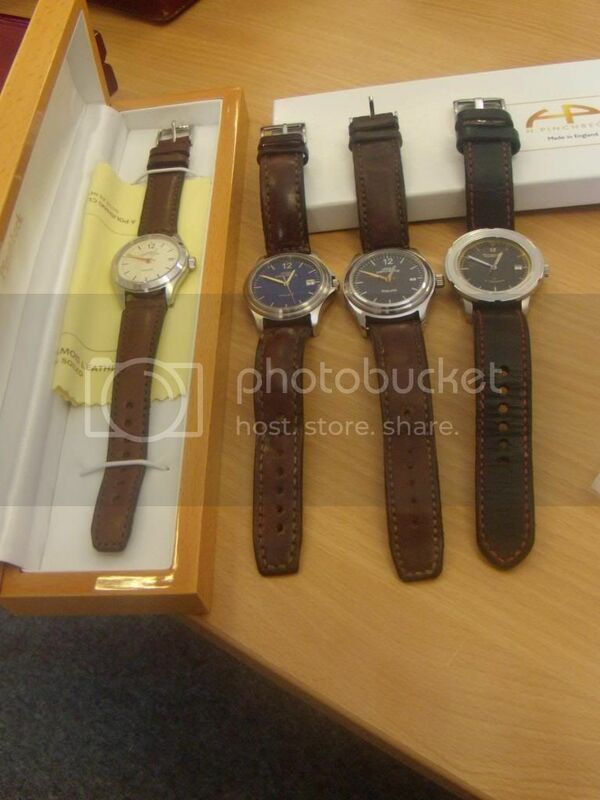 The picture below shows Paul Pinchbecks daily wear watch on the left, the watch that survived the round Britain row in the centre and the Brough Superior SS101 on the right. It has an old English look about it (which I mean in a complimentary way). 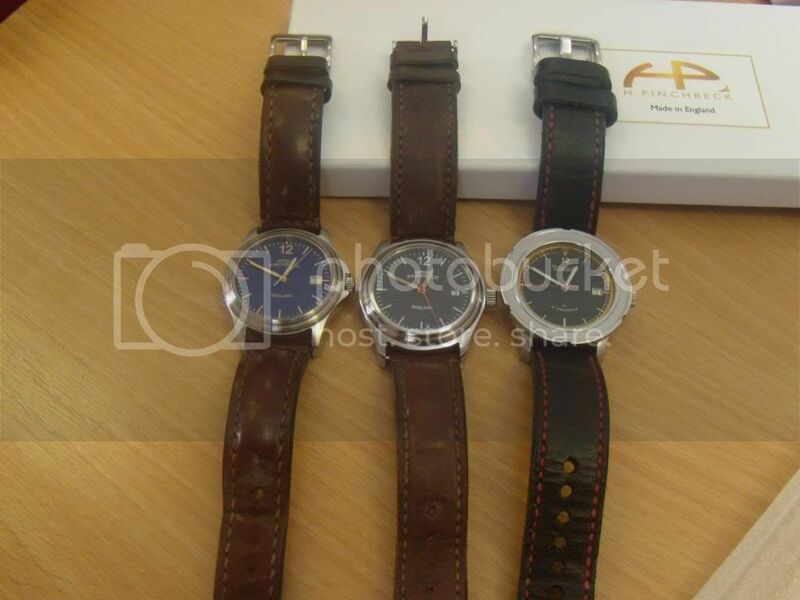 I could easily wear a 36mm watch but I guess that size would not suit everyone. What a treat to see England on the dial. All in all a big thumbs up from me. A fantastic watch, coupled with a fantastic story. The watch now has a fascinating provenance that will enhance its emotional attachment. People on another thread are talking about the future of cwl and the English watch industry. This is what English watchmaking/specialist industry is fantastic at. High skill, low volume and phenomenal service with the personal touch, making understated, classic and stunning pieces. Congratulations on a fine acquisition. what a great birthday jaunt. Open the pod doors Hal !! Wonderful pick-up! I paid a visit to them early this year and tried out various of the watches, just like you did. Very nice people too. Oh - are you sure it's an ETA movement? Very nice, alternative and traditional all in one. Many happy returns and all that. I'll drop you a line about Euro Days etc. atnits wrote: Wonderful pick-up! I paid a visit to them early this year and tried out various of the watches, just like you did. Very nice people too. Yes a George, The site says ETA, I haven't looked, no plans to take off the back. Congratulations. A great purchase. I agree totally with all the posts above about England on the dial, the timeless good looks and fabulous service. Thanks for posting, I am off to have a look at their site. Excellent! Lovely little piece, great to see 'England' on the dial and I am chuffed for you HvS. I wonder if they have plans to make them bigger? 44mm would be great, 42mm at a push. And a cyclops. And fully polished case. Perhaps even a cross-hair dial. Don't mind me. Hope you are enjoying your new toy. Sounds like you had a great day! I am pleased for you. 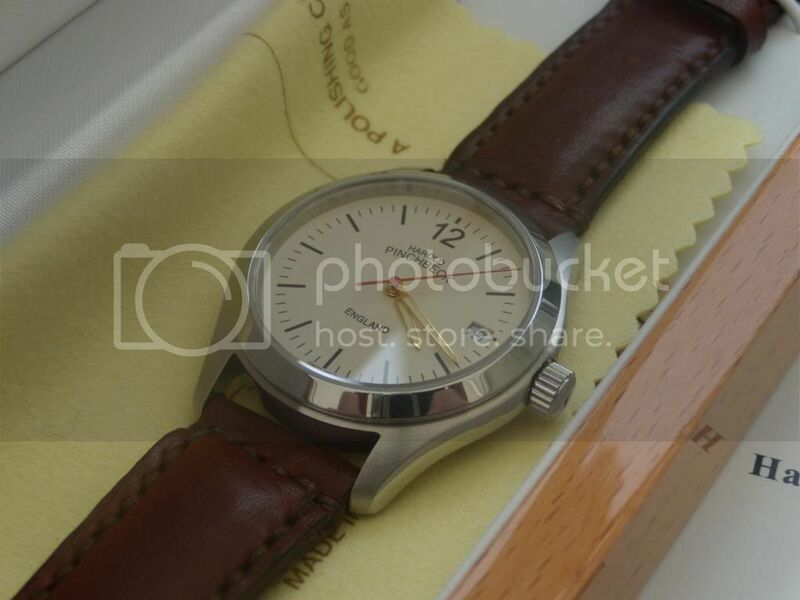 The watch has a nice, classy look, and the "England" text pleases a Finn as well. 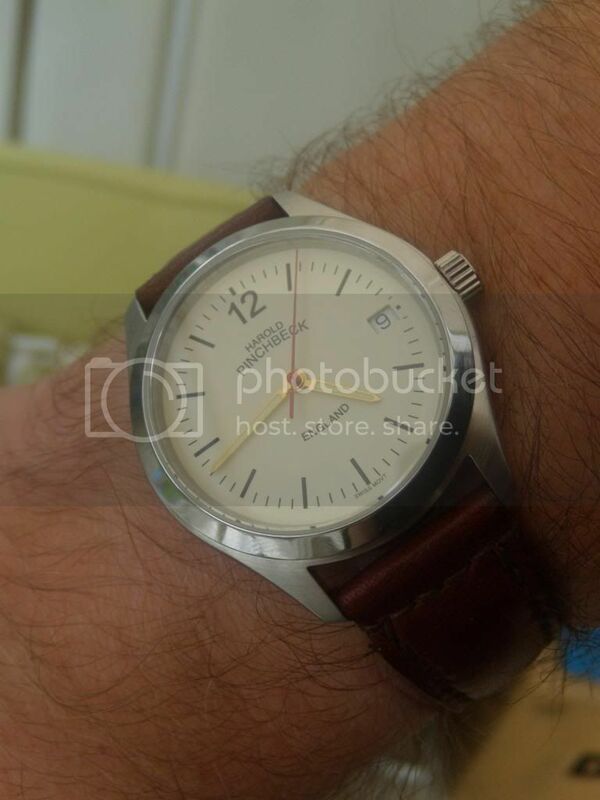 A great looking watch agree with everyone else about having England on the Dial. Nice to have such a nice personal service by people who love their product also offer i nice customized service with case size's and straps. one more manufacturer to look out for. In the beginners mind there are many possibilities, in the experts mind there are few. Oh, believe me, I've thought about it! I think they're absolutely gorgeous, but haven't got round to it yet. Maybe soon. Fantastic acquisition, Gary - congratulations!